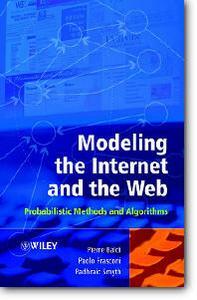 Modeling the Internet and the Web covers the most important aspects of modeling the Web using a modern mathematical and probabilistic treatment. It focuses on the information and application layers, as well as some of the emerging properties of the Internet.  Provides a comprehensive introduction to the modeling of the Internet and the Web at the information level.  Takes a modern approach based on mathematical, probabilistic, and graphical modeling.  Provides an integrated presentation of theory, examples, exercises and applications.  Covers key topics such as text analysis, link analysis, crawling techniques, human behaviour, and commerce on the Web. Interdisciplinary in nature, Modeling the Internet and the Web will be of interest to students and researchers from a variety of disciplines including computer science, machine learning, engineering, statistics, economics, business, and the social sciences.